Wrinkle Release Spray is specially formulated with natural ingredients to remove unsightly wrinkles in no time. Contains unique biodegradable ingredients found in natural hair conditions that gently condition as they effectively remove wrinkles while preserving the shape of the garment. It is naturally fragranced, phthalate-free and safe for bright colours and delicate fabrics. Great for at home or on the go! How to use: Simply spray lightly, then gently tug and smooth the wrinkles away! 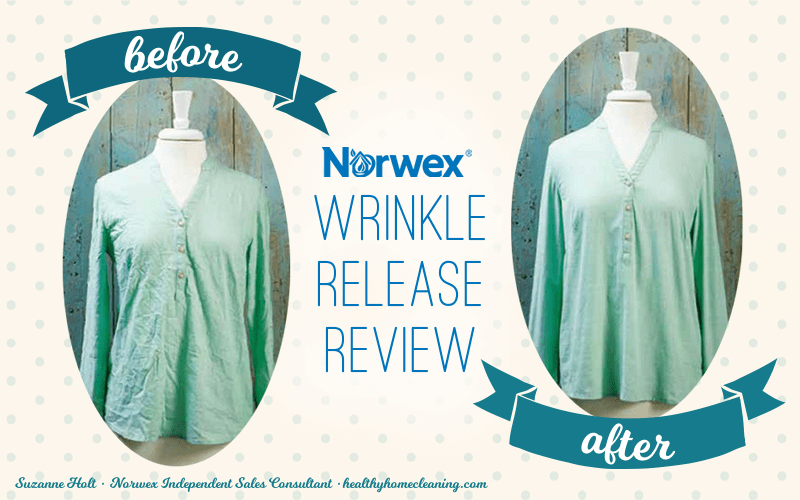 You can buy the Norwex Wrinkle Release Spray online from me, in Australia. Or you can buy it in New Zealand here. If you are elsewhere, check Norwex.com to find a consultant in your country. Great Wrinkle Release Spray Instructions! Downy Wrinkle Releaser Plus doesn’t just release wrinkles, it can also fight static cling. Your all posts are very helpful. I love your another post :”Natural Deodorant Stick Instructions”.